One thing I neglected to mention in depth from the latest Update 27 content in “Trials of the Archons” is the named loot. Like the archons themselves, the quality and amount of named gear is luminous. 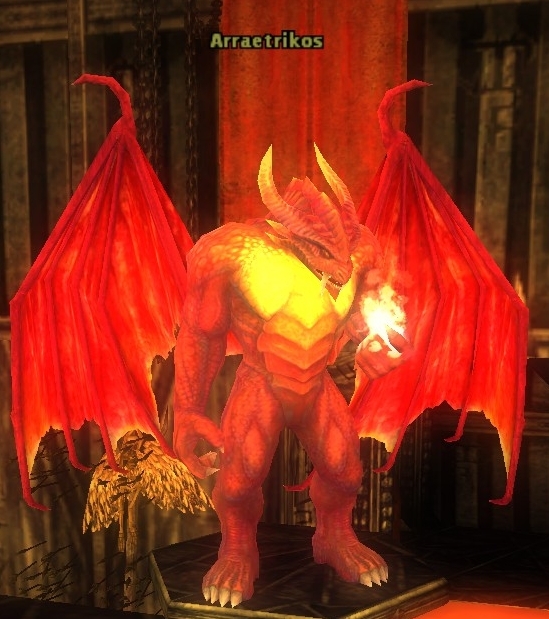 But one item in DDO’s page that details the items grabbed my attention immediately. The hunt began with the release, and part 1 of that hunt ended last night in spectacular fashion. 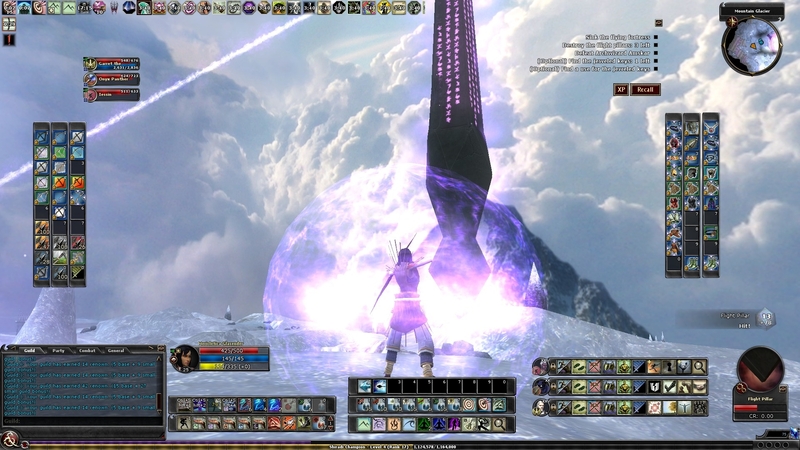 Tyrs Paladium, my home on the Ghallanda server, completed a Heroic run of the three new quests in Amrath earlier in the week, and then proceeded on a Epic run last night. 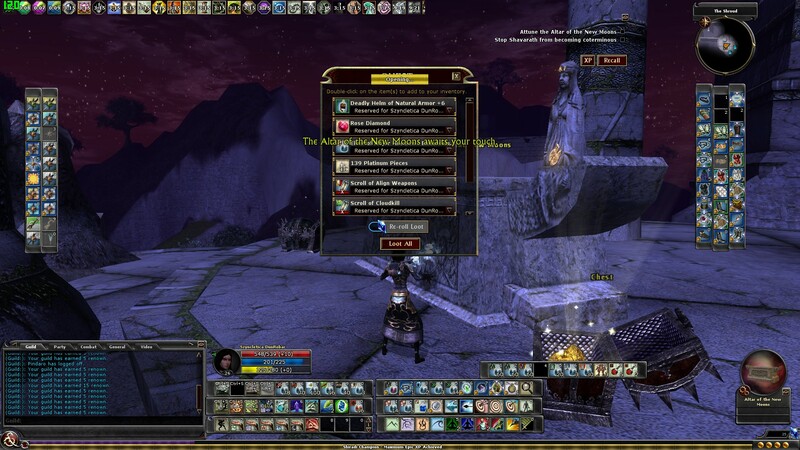 I led a group of four able-bodied folk into the three quests, all on Epic Elite. I’m usually pretty conservative on difficulties when in a live party. But I was in control of Szyncletica the Starwielder, Solitary Destroyer of the Shroud. My strongest offensive character. The trash was CR 76. That’s not a typo. Szyn behaved as a ranged tank, her Improved Precise Shot and off-hand Fiery Detonations by her off-hand Celestia easily aggroing everything in sight. Combined with her permanent Haste and attack speed from the Blinding Speed epic feat, I was able to keep the swarms from overwhelming us in most locations. Then there were the bosses. The bebilith mid-boss was a CR 83 as was the Planetar leader end-boss. While the bebilith fell after about 5 minutes, the green-skinned Planetar was the biggest bag of HP I’ve ever encountered. Before we could concentrate our fire on her, we had to dispatch her entourage of super-deadly Lantern Archons that peppered us with Searing Light rays of 150 points of damage or more, and Devas with brutal bludgeoning attacks. It took over 10 minutes of continuous fire and beat downs to defeat the Planetar. Onto “Demon Assault.” That run gave our team no dramatic surprises until the end-fight. I tried to pull a few enemies at a time, keeping the team far from the lethal Shavarath blades. Having run this quest a couple of times before, I recommended that the team fight the boss first to complete, which typically has left a gate between the boss fight and a shrine open to us. But on Epic Elite, that gate closed, and we were met by dozens of Shavarath renders of fire, frost and flesh, trapped there to fight or die. It looked like we were about to immediately wipe as Dungeon Alert built up to Orange, but IPS came to the rescue. I circle-strafed the entire legion of renders to keep them off the main party while they chewed on the boss. That had to be one of the most intense tanking fights I’ve done in a long while. Thankfully, the spawns did stop and we completed the quest and then took on the optional meralith for a trivial chest and some additional XP. In the last quest, “The Devil’s Details,” even the normally trivial Tiefling Marksmen were deadly as we raided a stronghold of Aaretreikos. By the end fight we chose to stay at the top of the stairs to limit what we had to fight. 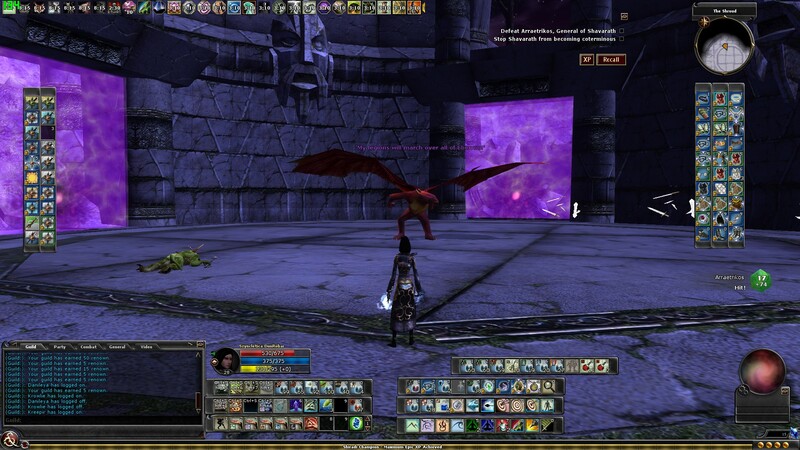 The Erinyes boss–so strikingly beautiful as she was deadly–was a CR 83 as well and took some time to kill. After completion we finished off what trash remained between us and our end-loot. I didn’t see what I was looking for in my allotment, but a fellow guildmate did receive it and passed the item to me. Behold, the Dawnbringer. The fourth named shuriken in-game and the second one to come with both Heroic and Epic versions and an augment slot. And, like all other named stars, this is a Bound-to-Account weapon. The stats you see above reflect what the weapon does when I, as a Ninja Spy, equip it. The day was over and I haven’t yet a chance to see what it can do. But soon, legions of evil, soon you will follow and fall to the Dawn. I’ve fully trained my Zen Archer build. 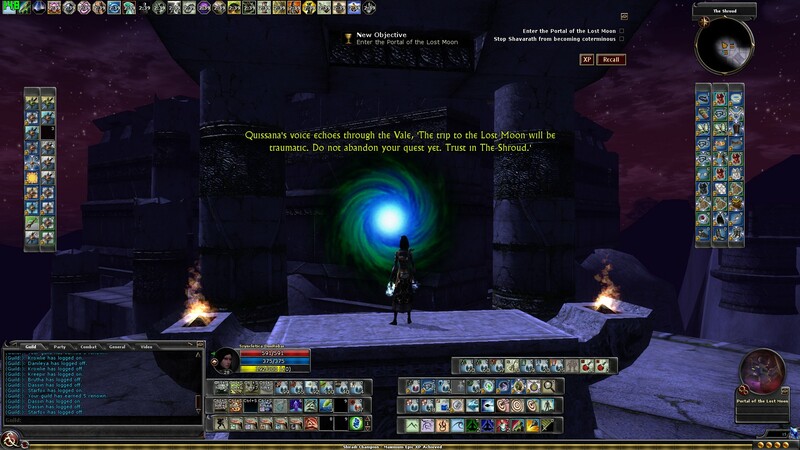 Equipping this first one, Mericletica, will still take time on the quieter realm of the Cannith server, but all the central enhancements and initial destinies are done. I’ve still got the level 16 Pynthetica to complete on Ghallanda, but as a third-life it’s going so slow to level her. The build’s a great alternative that delivers damage while providing all the benefits of complete Monk levels in both offense and defense. This post is also a kind of apology and shout-out to Firewall’s Shuricannon 2.0 build. I’ve been so ADHD or just plain overwhelmed in other matters that I’ve only begun a 2.0 ‘Cannon and so haven’t been able to talk much about it. The Zen Archer has been my obsession of late, and that time spent was worth it by adapting concepts from the ‘Cannon, as I’ll explain. I’ve talked extensively on the original Shuricannon. Firewall has since upgraded the build to deliver more fortification bypassing for more damage. 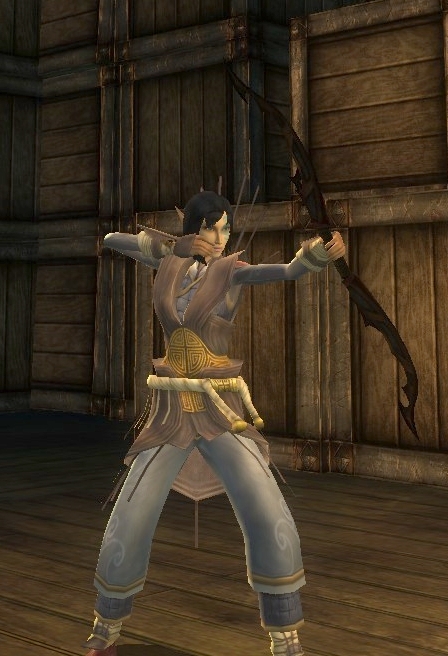 Much of the Zen Archer’s design is very similar to the Shuricannon, directly or in principle. High miss-chance and general defenses (30% Dodge, 25% Incorporeality, 20% Concealment). 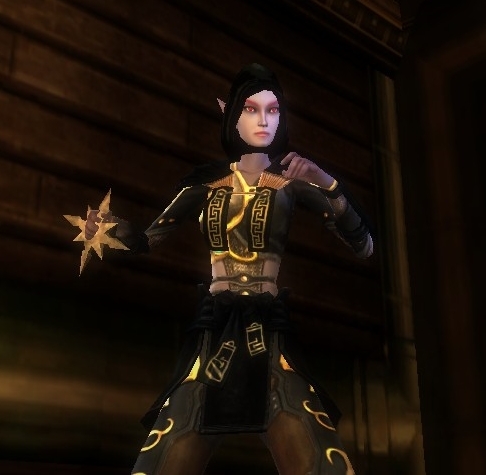 Firewall’s build adds in Lesser Displacement (25% Concealment) from an upgraded robe from “Temple of Elemental Evil.” I’m working on that myself. Unlike his Drow-based build, however, I go Elven, and have the Shadow Dragonmark for invisibility and Displacement. Saekee’s tip to use Harper Agent’s Magic of Patience enhancement allows me a 5-minute Displacement at level 28, reducing the need to get Green Steel clickies. The differing playstyle reduces the need for the number of Displacements. The Zen Archer’s role is the opposite of the ‘Cannon. The ‘Cannon is a capable “flying tank,” with its Monk speed, PRR and miss-chance. However, by Epic, it only uses ki for Ten Thousand Stars with Shadow Veil. The Zen Archer uses ki more often for GMoF attacks in that mode. When in other destinies, I try to twist Enlightenment for +1 passive ki. Else, I have only +2 passive ki when in Sneak and from Ultimate Ocean Stance. The Zen Archer is a sniper. The Shuricannon specializes in higher DPS by leveraging Doubleshot-like advantages from both the Drow-granted Shuriken Expertise feat and the Ninja Spy’s core abilities, specifically Advanced Ninja Training. 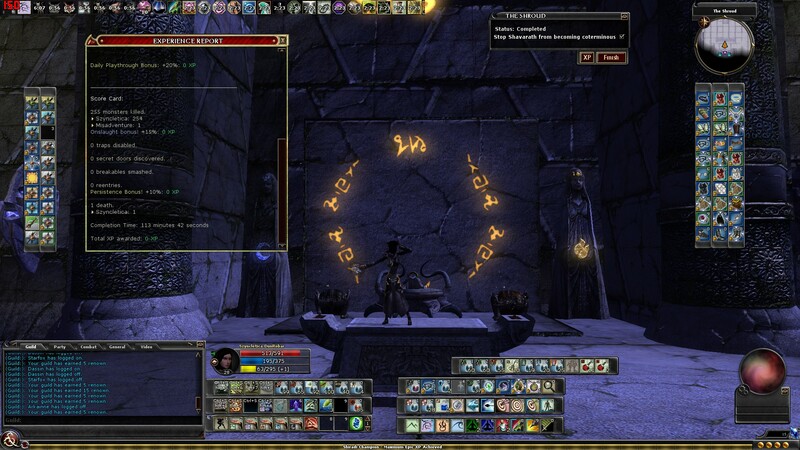 The Zen Archer is an Elven build. Firewall took Drow for Shuriken Expertise and damage bonuses, and Ninja Spy for DEX-to-Damage with stars and other damage bonuses. Along similar lines of reason, I chose Elf to give immediate proficiency for longbows and, with training, DEX-to-Damage with bows. Both Zen Archer and Shuricannon then ramp up DEX to the maximum possible to deliver damage. As bows don’t gain further benefits in Heroic DPS beyond Sneak Attack damage and the No Mercy enhancement from Ninja Spy, I adjusted my build to concentrate on the benefits of the Harper Agent enhancements to add Ranged Power and, later, stacking Deception to slow and Bluff enemies, where SA gains additional damage. By Epic, I’m adding more bow damage from the Grandmaster of Flowers destiny, using A Dance of Flowers and Piercing Clarity on top of the destiny’s Ranged Power and Epic Power leveling bonuses. Further, the Zen Archer’s longbows deliver greater base damage per hit. My Szyncletica’s best stars see 60-75 damage per hit, although there are a lot of other effects that certain shuriken gain for DPS per hit, especially Ninja Poison, which the Zen Archer cannot do. The Zen Archer’s base hits with a Thunder-Forged Longbow at level 28, in Grandmaster of Flowers, is 150+ once all competency bonuses are up. 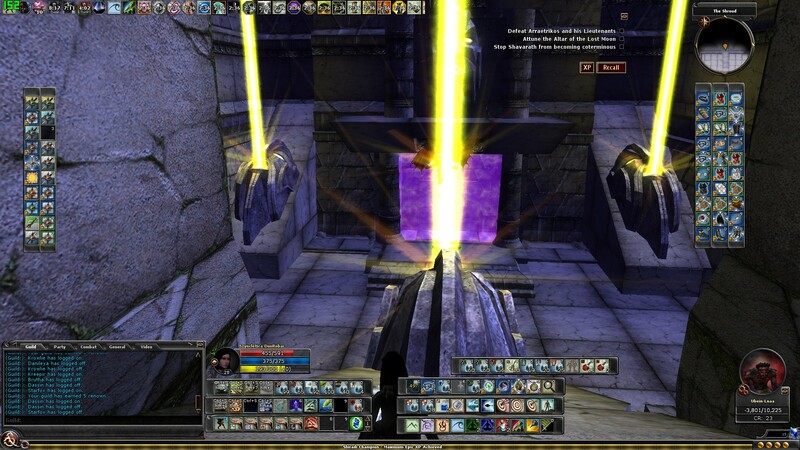 I tested the overall DPS on the planar gateway portal in Aussircaex’s Valley. While Szyncletica could take that portal down in about 45 seconds with Ten Thousand Stars, Mericletica with Manyshot blasted that thing to bits in under 30 seconds. I still have a TTS and normal bow test for her, but the base damage is clearly superior with a bow, even if the total sustained DPS works differently. I have Manyshot and TTS and better Doubleshot outside of this, versus Szyn. However, I didn’t let Szyn train two destinies to gain the Doubleshot feat to further improve her sustained attack. Meri’s fortification bypass is also superior to Szyncletica’s, which started off on Shiradi Champion to immediately benefit from Whirling Wrists and related damage enhancements. Shuricannon 2.0, with gear, can get higher bypassing. Like the ‘Cannon, bonuses to critical hit threat and range ramp up the damage. But here, the Zen Archer sees critical hits in the 1500 or greater range since, with Earth Stance and Overwhelming Critical, I get a x5 effective multiplier (the ‘Cannon does this too after a fashion and with another destiny). I never saw such critical hit numbers with my ‘Cannon, but again, DPS is subjective. I do see similar take-down speed with the Zen Archer as the ‘Cannon. However, both builds are played very differently. The ‘Cannon is a berserking, running attacker. The Zen Archer is a calm, near-motionless, balanced sniper. As such, the ‘Cannon clears more enemies per minute, but the Zen Archer can zap down a single tougher enemy as fast yet not endanger itself. I clear rooms and dungeons very well. I just do so one enemy at a time as fast as possible. Defensive advantages from full Monk training. The Shuricannon has stronger innate magic protection from the start as Drow gain Spell Resistance that grows as they do. The Monk’s Diamond Soul feat adds this in at level 13 for the Zen Archer. The two features are identical and, thus, don’t stack on the Shuricannon. Grandmaster of Flowers and an airship buff add a little more stacking bonus. I managed to work in the highest fortification I have ever made on a character with the Zen Archer: 205%. This comes from a 25% Exceptional Fortification loot-gen helm, 40% from the Unyielding Sentinel’s Brace for Impact, 125% Fortified gloves, and guild ship bonuses that filled in the rest. This should ensure that the Zen Archer can stand and fire without as much concern against any melee enemies that get too close, except Champions, the bane of many a build, which often can ignore one or more of the Zen Archer’s passive defenses. The Zen Archer is still a ninja at heart and has very strong Hide/Move Silently skills to go where it wants without detection. Having Abundant Step is key here–and having sufficient ki to use it repeatedly without compromising my ki store. The Zen Archer in Grandmaster of Flowers mode regenerates +4 ki at maximum, gaining a maximum 240 ki held fully charged. I can use many offensive and defensive abilities without dangerously depleting my ki pool in extended fights, and regenerate ki very rapidly between each battle. It also allows the use of shrines to recharge my spell points without worrying about ki loss. I still find the Way of the Sun Soul set helpful for the Zen defense. To go with the miss-chances, Reflex saves, Improved Evasion, high fortification and Spell Resistance comes the 25% damage-reducing Radiant Forcefield effect that often procs while in Earth Stance while I deliver maximum critical hit damage from that stance’s benefits to weapon. The only enemies that make the Zen Archer move are Champions. They threaten one or more of my defenses at all times. But keeping GMoF as the central destiny grants me emergency damage through the knockdown effect of Drifting Lotus, where I can then Pin that enemy and eliminate it. Both Zen Archer and ‘Cannon use similar gear, outside of the weapons, of course. In my case, as I don’t run as many specific quests as Firewall is able to do to get the best of the best, I’m still adding in effects that both builds enjoy to squeeze that last bit of DPS from every shot. In fact, youshould be able to use the same gear for thisbuild as the ‘Cannon if you’re able to obtain it. Here’s what I have for now. Shuricannon 2.0 revels in this, and the Zen Archer took more than a few pointers here. It’s one reason why I’ve found that the Grandmaster of Flowers destiny provides the best overall offensive and defensive balance for this build. You can gain more DPS from Shiradi Champion and more burst DPS from Fury of the Wild, but GMoF’s Piercing Clarity adds 10% additional fortification bypassing to go with the 25% of Precision feat for 35%, and a 5% guild buff for 50% currently. I’ve trained up a bit of Shadowdancer and used Grim Precision and its 15% bypass bonus. If I train up more destinies for more fate points, I could upgrade a Twist of Fate slot for tier 3 to use that as well for 65% with Grim Precision. 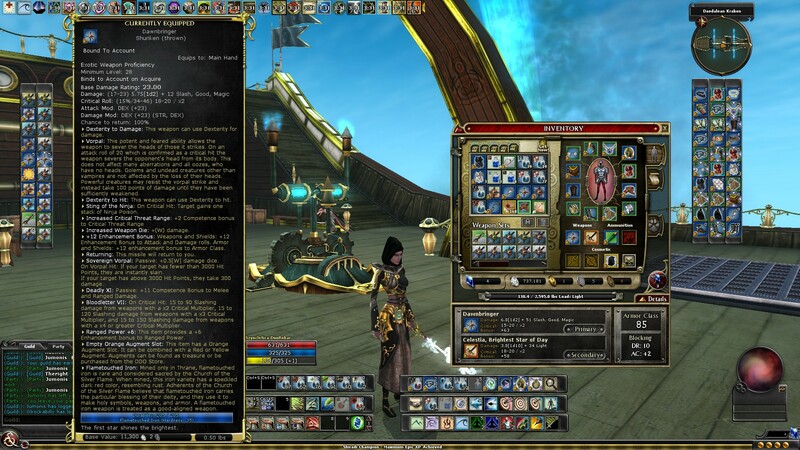 Even Heroic level Black Dragonscale Robes will add 10% Armor-Piercing for 75%. I’m making routing Heroic Elite runs into Gianthold Tor, quickly gathering 3 White and Black scales for the next lives and using that armor. On Cannith, I don’t see a lot of opportunities to build Flawless Black Dragonscale Robes for 15% Armor-Piercing, but hope springs eternal with an LFM. Two key rings, the Ring of Shadows and Seal of House Avithoul, provide Hide/Move Silently defenses, Blurry, 10% standing Incorporeality (saving ki to reduce use of Ninja Spy’s Shadow Veil) with Improved Deception (stacks with the Harper Agent enhancement) and Sneak Attack bonuses. This slows charging enemies but also greatly slows attacks by even Red Named enemies when Manyshot is running. The continuous high-speed hits tend to permanently turn away bosses and slow their attacks, making take-down faster. Shadowdancer’s permanent Shadow Form will save some ki later here. Saekee and I learned during an EE run into “The Claw of Vulkoor” that Deception effects per player tend to “lock up” bosses to the point where they can’t make attacks or defense. They’re in a state of permanent Bluff while the DPS holds. Saekee had at least one Deception effect and I have two. Defensively, the Way of the Sun Soul set also helps in Earth Stance with PRR bonuses, including a boost from Standing with Stone. I do want to add a Sheltering augment somewhere to fortify my total soak damage reduction to around 45-60 PRR. I have unlocked a Spider-Spun Caparison outfit with Improved Dexterity +3 for more HP. Replacing the Boots of the Woodsman I’ve worn are a pair of Surefooted Boots. This grants the Mobility feat for 2% more Dodge but also has a Green augment slot where a Topaz of Power +150 sits to give more spell points for Rejuvenation Cocoon. Replaced my Nightforge Gorget with a temporary necklace with Wisdom +8 and a Yellow augment slot used with a Deathblock gem. I hope to find the Necklace of Mystic Ediolons for inherent Deathblock, better Improved DEX and CON but also (once upgraded) Augment Summoning for +4 to my summoned and hireling ability scores, which would make them more helpful in Epic Elite, especially running Primal Avatar for additional boosts. The Tier 1 Thunder-Forged Longbow with a Good augment gem is the primary weapon, punching anything it targets, especially dragons. If I find any groups running the Thunder Peak raid enough, further upgrades of the weapon would be nice. 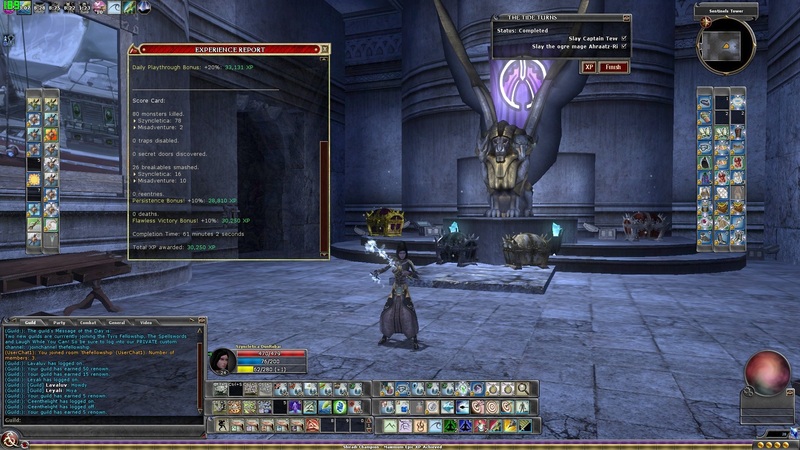 I’m getting well-acquainted with “Temple of Elemental Evil” enough to start hunting for the Epic Sapphire Sting, the only other bow that makes the TF bow seem weak. I’ve completed my Shroud flagging. I have one first Green Steel desire: A triple-positive bow for handling undead bosses. I’m confident that Mericletica might do something only Szyncletica has managed: Completing the Shroud alone. The need is less in bragging rights than the low population on Cannith. I trained more destinies on this character than I ever had on any character to date. I started with GMoF, bypassed Legendary Dreadnought for expediency to get Shiradi Champion and Primal Avatar trained to qualify for level 28 Epic Destiny feats, and trained Shadowdancer to gain more fate points to upgrade slot 1 to tier 2. I plan to train Legendary Dreadnought, Fury of the Wild and Shadowdancer to gain three more fate points to get tier 3 unlocked. I know Firewall loves Divine Crusader, so I’ll be tooling through Unyielding Sentinel for more fate points and to unlock that destiny too. While in Grandmaster of Flowers, I have Pin from Shiradi in an upgraded tier 2 Twist slot and Rejuvenation Cocoon from Primal Avatar in the second and third Twist slots. This allows three important GMoF abilities to stay up without Twisting (Piercing Clarity, A Dance of Flowers for 1.5W damage increase, with Enlightenment and the innate abilities Ubiquity for Tumbling through enemies and Balance in All Things keeping ki regeneration at its maximum while also giving knockdown immunity). GMoF’s offensive powers, also help in defense and damage, especially Drifting Lotus, and it allows me to have the room-obliterating Everything is Nothing available on boss fights. Shiradi Champion works very well at the expense of defense and ki regeneration. Pin and Otto’s Whistler are impressive attack modes that make this destiny great in smaller fight scenarios. Primal Avatar is a great defensive destiny that boosts my character’s outward defenses, specifically with hirelings. The aggro-magnet Elder Dryad allows me to pummel things from afar longer. Of course, Rejuvenation Cocoon is a requirement for most characters and is easy to train. The Zen Archer tries to avoid being too dependent on it as the ultimate balance between DPS and defense is the goal of the build. If the Zen Archer is taking so much damage that Cocoon has to be used all the time, the build’s not doing what it should. The Blinding Speed Epic feat gives permanent Haste for 22% Ranged Alacrity. The level 28 Epic Destiny feat Doubleshot adds 10% Doubleshot for a total of 15% with Elven and guild ship bonuses. Off-destiny, this build still does good damage, but does enjoy the Ranged Power bonuses from each destiny. That said, Fury of the Wild’s intentionally nerfed +1 Ranged Power (balancing out the monkchers that use that) is less attractive than GMoF and Shiradi or Shadowdancer. I’ll be pasting the final build later on my forum thread for anyone to import into Character Builder Lite, and update the first post with the final information. I have a video to share of this build tackling a battle to give an idea of its power. The Zen Archer isn’t bad at all in Epic Elite, but you do have to pick battles with care as you would any character. Comments welcome. Be sure to click the “CC” for captioning that explains the tactics as the video goes along.